When it comes to our pets, there’s not much we wouldn’t give them…we just want them to have the best and be the healthiest they can be. Because of this, we started making our own dog treats; there’s something about knowing exactly what’s going into them that gives us peace of mind, and these frozen mint treats are our new favorites – they’re just so good for our (not so) little fur babies!! The brilliance is not just in the money you save on treats or the sheer fun of watching your dog(s) devour them; due to the mint, these treats will also help get rid of your pup’s doggy breath! This recipe is a sure-fire hit for both dogs and their humans! 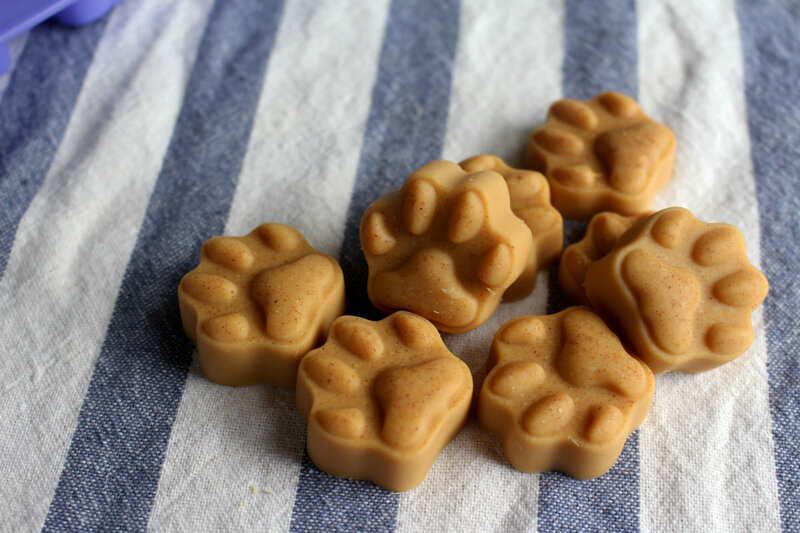 And with a crazy cute paw print ice cube tray, the finished treats are as adorable as they are delicious – all you have to do is pour your mix into the tray and stick it in the freezer; it’s that easy! Grab your paw print ice cube tray set here! Place yogurt, mint and parsley together in a food processor and pulse together. If using, add in honey and pulse to combine. Pulse until herbs are finely chopped and everything is fully incorporated. Transfer mixture to ice cube tray and freeze until treats are set. Serve treats to pups as needed and store remaining treats in freezer. Enjoy!